Montecito Restaurant is a partnership between Toronto-native and Hollywood director Ivan Reitman and Master Chef Jonathan Waxman and sits in the bottom of the Daniels Cinema Tower in King West. This place is massive - there is a huge main dining room, an upstairs bar and lounge, a cozy brasserie and a patio. It seats 400 and each room is tastefully decorated with Ghostbusters memorabilia, figurines, movie stills from the 80's and cast portraits. Mondays are for Craft Beer & Burger at $16 + 1/2 Price Craft Draught. Tuesdays boast Classic Cocktails & Half Price Bar Menu in the upstairs Directors Lounge. Wednesdays are for Wine with a sampler offering 4 servings and charcuterie at $19. Plus 1/2 price bottles and free BYOW. 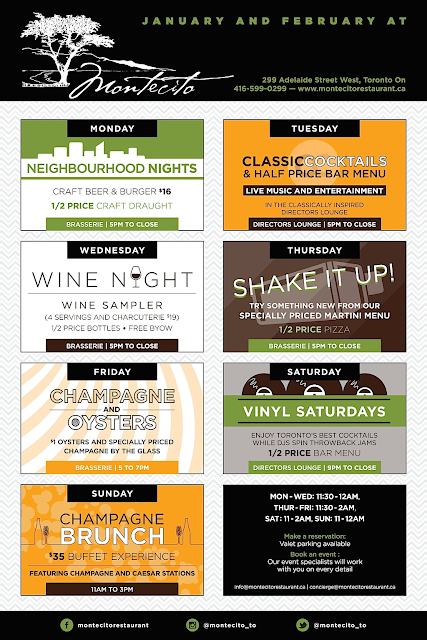 Thursdays get ready to Shake It Up with a specially priced Martini menu and 1/2 price Pizza. Fridays we toast the end of the week with Champagne and $1 Oysters. Vinyl Saturdays sit back and enjoy Toronto’s best cocktails, a 1/2 price bar menu and listen to throwback jams. Sundays are for sleeping in and Champagne Brunches ($35).